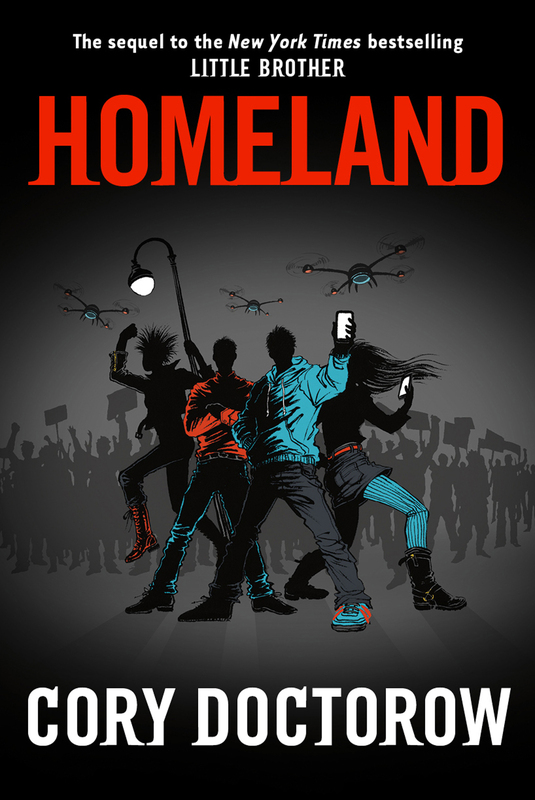 Homeland by Cory Doctorow. Tor Teen (an imprint of MacMillan Publishing), 2013. 400 pages. Publisher recommends for ages 13 and older. ISBN: 9780765333698. Homeland is a sequel to Little Brother. Marcus Yallow, still the narrator, is now 19 years old. He’s still dating Ange. His parents have lost their jobs in an economic crisis that has hit California. Marcus has had to drop out of college and is himself trying to find a job. Marcus and Ange go to Burning Man in the Nevada desert. While there, Marcus runs into Masha, a character from Little Brother. She hands him a USB stick and tells him to release the contents of the stick onto the Internet if she is kidnapped. Shortly thereafter, Marcus sees her being forcibly led away from Burning Man by Carrie Johnstone, his arch nemesis. There are 800,000 documents on the USB stick. Marcus and his friends try to figure out how to release those documents responsibly and in a way that can’t be traced back to them. Marcus is offered a job by the charismatic Joe Noss, a candidate for the California State Senate running as an independent. Marcus believes in Joe. He believes California will be better off if Joe wins. The book goes into a great detail of technical information about the Internet. It also goes into detail about the uses of the Internet. The central conundrum seems to be how to release the 800,000 documents anonymously and responsibly. It’s a conundrum Marcus didn’t ask for and doesn’t want. But the Internet is a powerful tool to disseminate information and Marcus knows how to use it. Along the way, we see the breakdown of society as we watch the way the city of San Francisco deals with peaceful protests. The end is a little too pat for me. Besides that, the pace gets bogged down when Marcus explains technical details. Nevertheless, it deals head-on with political, economic and societal issues that are of immediate concern in this country. The book contains two Afterwords that serve as calls to arms, one written by Jacob Appelbaum of WikiLeaks and one written by the late Aaron Swartz. There is also an excellent bibliography by Cory Doctorow. In the end, Marcus says “The system was people, and I was a part of it, part of its problems, and I was going to be part of the solution from now on.” This, I believe, is the take away line. In addition, the reader also takes away the memory of a fun story. This entry was posted in Fiction, United States, YA and tagged Computer Hackers, Cory Doctorow, Democracy, Political Campaigns, Tor Teen by Liz Parrott. Bookmark the permalink.